“a bow? !” I am seriously bow challenged – love them, but can’t tie one to save my life (except on my sneakers). With Miss B still outside I decided to go to work with this sketch…so the base spoke square to me (my new favorite size 4.5 X 4.5) Polka Dots? My brand new Brushed paper packet was sitting on my desk – hmmm, yep Polka Dot B&T. Now for the image? Since I’m thinking Daffodills, I guess A Little Note will fill that bill. I also grabbed some contraband ribbon and a button (Vicki at the Wizard’s Hangout has a great little tutorial on how to tie a bow). OK, with all my supplies prepared here’s what I came up with. It just seems so cheery, now I need to get out my “Happy Mail” list and spread a little cheer. Would you like to be added to my Happy Mail List? Leave me a comment with your contact info and I’ll get you added. Have you picked up an album or two? Beautiful card – love the colours! So happy and so Spring-minded. Thanks for joining us at AHSC. 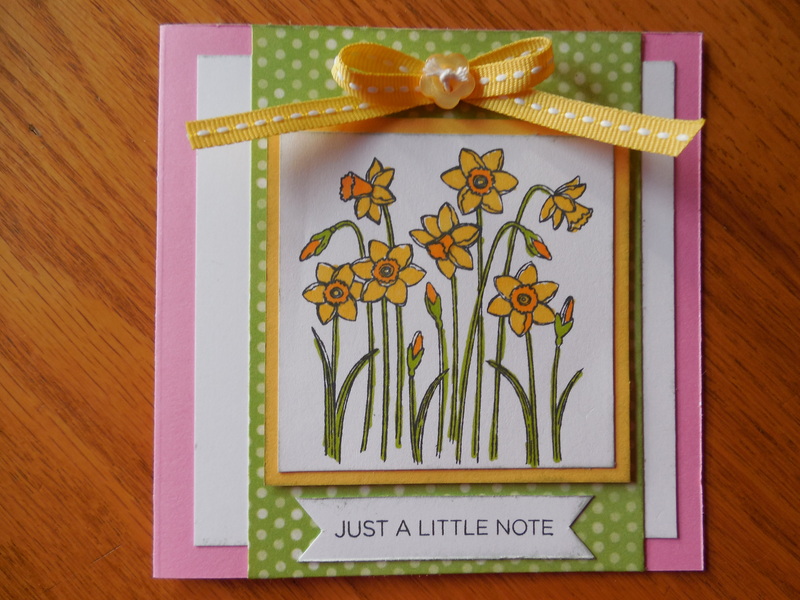 As cold as it is today this card is so springy and pretty! I might have to have that stamp! I knew I wanted it from the minute the Seasonal Expressions came out! It was hard waiting until the daffodils started springing up before using it. You did a great job with your bow! I love your colors – so springy! Thanks for playing along at AHSC! Tracey this is lovely. I adore that stamp, it is one of my favorite. As far as the ribbon goes, I do not think anything that makes you happy to use, is contraband. I am a CTMH consultant, and I use it all, and love it all. It was the perfect accent for your work, so go for it !!! Oh I love that stamp, it is on my wish list…darn limited funds, I want it all and I want it now! I really like what you have done with the card, super cute! Thanks for playing along with Atlantic Hearts Sketch Challenge! Oh Brandi…stamps are like chocolate, it is true. What a great idea, a happy mail list! I may start one myself. I love it! Love your card too. Can’t wait for spring flowers. Why not enter it in the monthly challenge at Craft Dee Bowz (http://craft-deebowz.blogspot.com/p/challenge.html) and maybe you’ll win a bowmaker! My Happy Mail list was inspired by Stacy Julian from Big Picture Classes. It has been super fun! A bowmaker sounds like something I definitely need…I’ll have to check it out! What a sweet card…great colors and love that stamp set….